SynaptiCAD is proud to announce version 14 of their timing diagram editors: WaveFormer Pro, Timing Diagrammer Pro, and Data Sheet Pro. Dozens of new features have been added including sampled analog signals, support for Xilinx post-route timing files, and memory optimizations to handle waveform files with over 1 million signals. SynaptiCAD has also made improvements to its free waveform viewer. SynaptiCAD's timing diagram editors support FPGA-based designs by providing a method to import post-route timing information and calculate complex timing for the most advanced chips. The timing diagram editor provides designers with a natural interface for analyzing critical timing paths inside their FPGA design. The timing diagram editors also support delay correlation groups to take into account the fact that delay variation within any particular IC will be much more tightly grouped than delays over the same types of ICs. Using correlation groups helps designers recognize when it is possible to meet timing specification even when traditional min/max timing analysis shows an overly pessimistic analysis. "This new version represents 18 years of constant development on our timing diagram editors," said Dan Notestein, president of SynaptiCAD. "We are quite proud that our timing diagram analysis tools enable designers to create systems that operate at the cutting edge of timing closure." SynaptiCAD's timing diagram editors support mixed analog and digital waveform viewing, export to SPICE formats, import of analog waveform data, and creation of analog signals. Version 14 enhances analog waveform creation by adding support for exponential waveform creation, and by providing a method of creating "sampled" analog waveforms. When using one of the built-in analog waveform equations (e.g. sine, capacitor, ramp, or exponential) to generate an analog equation, the designer can set a sampling period for all newly generated analog signals. SynaptiCAD's timing diagram editors, the free WaveViewer waveform viewer, and GigaWave optimize memory usage to handle very large waveform files with over a million signals without slowing down. It is often difficult to find relevant waveform information from data that is created by long Verilog or VHDL simulations. With SynaptiCAD's interface you can selectively view signals and timing periods and compare different waveform files. 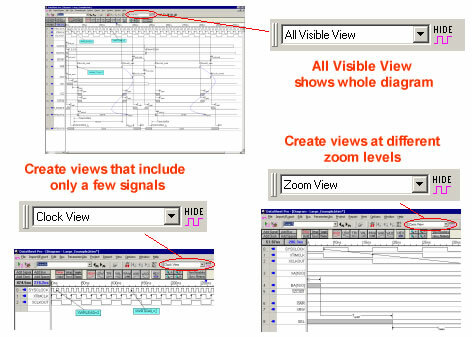 DataSheet Pro users can create Views of a diagram, then use the Views to jump to particular sections of the diagram or zoom levels. This feature captures the current zoom and scroll levels and automatically displays that position in the diagram. Views can also be used to create different images of the same timing diagram. SynaptiCAD has three levels of editors so you can select the best price/feature set for your application. 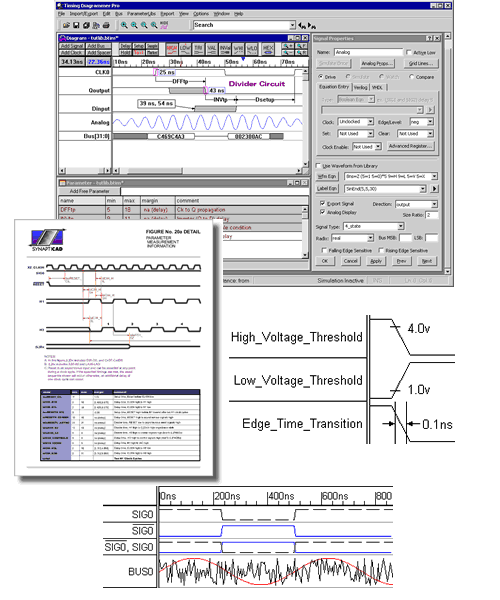 Timing Diagrammer Pro is a timing diagram editor with full timing analysis features and supports both digital and analog waveforms. WaveFormer Pro adds simulated signal support to make drawing timing diagrams faster and more accurate. It also can import and export to many formats including VHDL, Verilog, SPICE, logic analyzers, and pattern generators. And DataSheet Pro, our top-of-the-line editor, adds support for managing large numbers of timing diagrams including multiple timing diagram windows, multiple print views, and style sheets for uniform appearance.